On this page we provide details of travel from Geneva to Val d’Isere by taxi, bus, train or private transfer. So that you can choose your preferred method. 1st Lifts is an airport transfer company and we genuinely believe that a private transfer is the easiest and most comfortable way of getting from Geneva to Val d’Isere. We take you from the airport direct to your ski chalet or other accommodation. We even carry your bags and skis. We charge from around 75 euros per person (based on 4 people), one way and that is limited, by law, to a minimum of 2 people per van. We often offer heavy discounted prices for transfers taking place Monday – Fridays but you need to contact us directly to get our best price as these discounts are not always advertised. From Geneva to Val d’Isere takes around 2hours 45 minutes on a ‘normal’ weekday with 1st Lifts, Saturdays are usually around 3 hours. On peak weeks it can be longer, depending on traffic and weather. Not the cheapest way from Geneva to Val d’Isere, a taxi can be about €680 one way. More often than not there are plenty of available taxis to be hailed from authorised taxi ranks outside Geneva airport, in town and at the main station. Taxi fares between Geneva airport and the city centre range from CHF 35.00 to CHF 45.00, dependent on traffic conditions, time of day and number of passengers. There is a minimum fare of CHF 6.30. It is not possible to get directly from Geneva to Val d’Isere by train, as the train line terminates at Bourg Saint Maurice. However coaches will then take you from the train station in the centre of Bourg Saint Maurice to the centre of Val d’Isere. Geneva to Bourg-st-Maurice by train is about €33.00. SNCF (the National society of French railways) has an informative website from which you can check times of trains and costs of tickets from Geneva to Val d’Isere. The site is translated to English, just choose your language from the top right menu. Once you have arrived by train to Bourg-st-Maurice loca buses can be used to get to Val d’Isere. Or book 1st Lift Transfers to pick you up at the train station and take you to your accommodation in Val d’Isere. Buses travel frequently from Bourg-st-Maurice to Val d’Isere, dropping off at Gare Routiere, which is the bus terminal. Once there you will then need to get a taxi or a local bus to your chalet. We cover the local Val d’Isere shuttle buses at the bottom of this post. There is a good public transport system in the winter that links Val d’Isere to to the airports as well as the train stations. Buses from Geneva airport to Val d’Isere operate every day of the week in winter. There are 6 buses on Saturdays, 4 on Sundays and 3 all other days of the week. They take around 4 hours. Alti-bus will take you from Geneva to Val d’Isere or from Bourg-st-Maurice train station to Val d’Isere. It goes every 3 to 4 hours weekdays and every hour on a weekend. 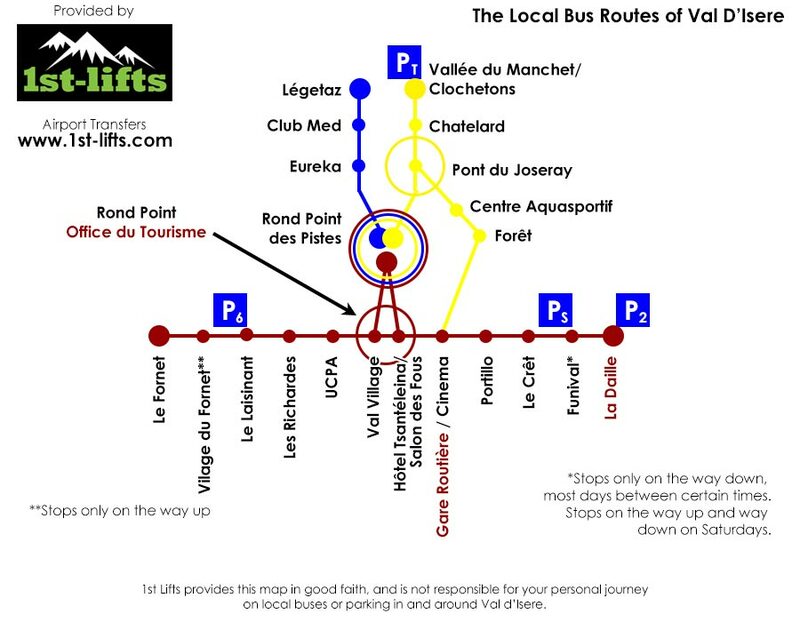 The Alti-bus drops you off at the Val d’Isere Office de Tourisme, which you can see on our map below. Here you can get a local bus, taxi or walk to your accommodation if you are close enough. From Geneva to Val d’Isere the Alti-bus is about €115.00 return. From Bourg Saint Maurice to Val d’Isere the Alti-bus is about €22.00 return. Ben’s Bus is a shared bus service that runs on Saturdays and Sundays through the winter season costing about £80 return, Geneva – Val d’Isere. Ben’s Bus service stops at the Gare Routiere and La Daille, which you can see on our map below. Here you can get bus, taxi or walk to your accommodation if you are close enough. Once you have arrived in Val d’Isere by public transport you will need to get to your accommodation with your luggage. Les Rond Pont des Pistes (Round About of the Slopes) in Val d’Isere is where the local buses operate from. These are free buses that will take you around the resort between December and April. There is a day service and a night service, which operates until about 2am. Please check the time tables on each stop for more up to date information. The red line goes from Le Fornet, and stops at Le Village, Le Laisinant, Les Richardes, UCPA, Val Village (Office du Tourisme), Rond Point des Pistes, Hôtel Tsanteleina/Salon des Focus, Gare routiere/cinema, Portillo, Le Cret, Funival, La Daille, and returns. The blue line goes from Rond Pont des Pistes and stops at Eureka, Club Med, Legettaz and returns. The yellow line goes from Rond Pont de Pistes and stops at Pont du Joseray, Chatelard, Vallee du Manchet/Clochetons. There is a branch that goes from Pont du Joseray to Gare Routière, via le Forêt and le Centre Aquasportif. Visit www.valdisere.com for information on local bus services in Val D’Isere. So you can see why we think that a Private Airport Transfer from Geneva to Val d’Isere is the nicest way to get to your ski accommodation. Call us on our UK mobile 0044 (0)7929 726475, our French mobile 0033 (0)6 98 21 59 78 or email info@1st-lifts.com to enquire. We hope you have a good journey which ever way you decide to travel! We’ve put together a short list of restaurants, cafés and après ski in Les Arcs area to help you to find a place to eat out on your ski day, or get together for après ski. The list does not yet include Peisey-Vallandry. We will extend on this list more and more, so please do return for up to date information. Let us know if you would like to be included. What: Seafood, meat, grills and more. What: All day crepes and waffles. Terrace and dining room. Lunch or dinner. Non stop service Saturday and Sunday. Where: Les Arcs, at 2200 metres. Above Les Arcs 2000 and the bottom of the Varet lift, just off the marmotte piste. Accessible to skiers, mountain bikers and hikers. What: Varied menu. From savoyard specialties, salads, soups or simple pasta. Real wood ovens giving full flavour to many of the recipes. Home made bread. Sunny terrace. Bar available. Open for lunch every day. Wednesday and Friday evenings. Winter and summer. Where: Les Arcs 1800, bottom of the Chantel ski lift, opposite ESF office. What: Traditional cuisine and Savoyarde specialities. Where: Les Arcs 1600. Bottom of the Combette piste take skiers left towards ESF. What: Rib of beef, Savoyard specialties and crepes inside a traditional alpage chalet. Open every day, noon and evening. Where: Les Arcs 1600, accessible by the Mont Blanc piste. What: Local specialities as well as French classics such as steaks or boar (sanglier in French) and Asian cuisine. Set lunch menus. Sunny terrace for a drink. Great views. Open in winter and summer. What: Rustic restaurant with a large terrace for lunch times or cosy interior to eat in the evening. Traditonal savoie food. Fondue inside large bread loaf. Where: Les Arcs 1950. Bottom of the Cabriolet lift, walk through 1950 past Les Jardins de la Cascade residence. At EVO2 go straight on, you will see Wood bear café on the right. What: Savoury tarts, homemade soup, sandwiches and toasties and other homemade snacks. Open 8am for coffee through to aprés ski. What: Fast food to eat in or take away. Where: Les Arcs, at 2200 metres. In the new chalet along the Marmotte piste, near the Restaurant Les Chalets de l’Arc. Vibrant music and a cosy atmosphere. Sunny terrace for après ski. Where: 1800, walk through 1800 past ESF from the bottom of the Chantel lift. Turn right at Quicksilver. What: Snacks including beef burgers, chicken burgers, nachos, wraps and salads. British run bar and grill. Comfy sofas on the sun terrace for food or drinks. Open 9.30 am – 2am. What: International, traditional and Savoyard cuisine. Tartare de boeuf, Burgers, fajitas, finger food to accompany aperitifs. Opening from 5.00pm to 5.00am. Bar and restaurant. Irish décor. Screens for sports, darts board and pool table. Excellent selection of beers. What: Traditional dishes (beaufort tart, fondue, raclettes), pizza, salads, sandwiches, duck, steak. Modern restaurant. Formule du midi available. Open 9.00am – 3.00pm, 6.00pm – 10.00pm. All year round. Sit on some up-turn snow shovels at the pizza counter and watch your pizza made. Can take away. Open for mid-day and evenings. What: Quality French and European foods. Menu changes. A treat for the whole family. All the information on this page has been supplied in good faith, we are not responsible for any mistakes. Please contact the proprietor of the establishment to check opening times and locations. Private transfers from Geneva to Les Arcs can be so much more comfortable than waiting for a bus, train or a shared journey. Our private transfer buses will be at Geneva airport waiting for you when your plane has landed, ready to take you to your accommodation in Les Arcs. 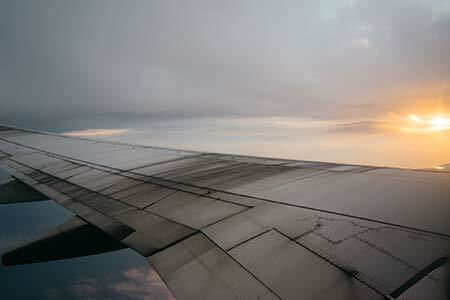 We check impending flight arrival times and try our best to be there, even if you are early. With a private transfer you and your group can sit back and relax, knowing you are in the safe hands of 1st Lifts transfer drivers. Even catching up with some shut eye on the way! Private transfers are really cost effective if there are up to 8 of you in the group. There are 8 available seats in each of our modern, comfortable vans. We can take groups of adults, or families including children. When you book with us we always ask the ages of the group. That way are well prepared with child seats for the transfer from Geneva. Booster seats and baby seats are available on request. Usually we take the main toll road from Geneva to Chambery, called the A41. Then we join the A43, leading to the A430 towards Albertville. At Albertville we join the N90, where we will start to drive up the Tarentaise valley and you can admire the mountains spotting Mont Blanc and getting really excited for your ski or bike holiday! If there is a problem on any of the main roads, we have two alternatives to Albertville: the A40 or D1508. Although we will avoid going through towns if we can help it, as we want to get you to your destination as soon as possible. We drop you as close to your accommodation as we can get, making your journey so much easier with all that gear. We know of a great place on the way to Les Arcs to pick up some croissants, a Quiche Lorraine, freshly cooked pizza and have a cup of coffee if you are feeling a bit peckish after your flight. By prearrangement we can also take you to SuperU in Albertville or the new E.Leclerc supermarche now situated near Moutier. It’s a bit closer to home and a pretty good price range. The roads are very well cleared when there is snow fall, even the ones leading right up to the mountain resorts, but we can never predict the weather! We all hope for lots of snow, so 1st Lifts is prepared. Each driver is trained to put on snow chains in even the worst conditions – even in the dark. We carry chains in each vehicle and we know when it is necessary to use them to bring your group to Les Arcs safely. If you have a playlist you would like to put on during your journey let us know! We’d love to hear it. Video your journey singing to your favourite songs and upload it to the 1st Lifts Facebook page. Make sure you tag your friends and family! The train station in Bourg saint Maurice is often mistakenly called the Les Arcs train station, we suppose because it is the main route into Les Arcs from airports, from Paris and other major cities. The Les Arcs train station is actually in the centre of a city called Bourg saint Maurice, which is at 840 metres and there is no skiing there! Although you can access the ski hill by the funicular, which whisks you up to Arc 1600. The Bourg saint Maurice funicular is a short walk from the “Les Arcs Train Station”, accessible with bags as you can cross a bridge over the train line. 1st Lifts can be booked to take you from Bourg st Maurice to one of the Les Arcs resorts: Arc 1600, Arc 1800 or Arc 1950. Les Arcs is a popular skiing, snowboarding, mountain biking and road biking destination which is part of the Paradiski domain in the Savoie region of the French Alps. Les Arcs consists of 5 villages at different altitudes: Bourg-saint-Maurice (at about 744m above sea level), ARC 1600, ARC 1800, ARC 1950 and ARC 2000. Open all year round, les Arcs gives access to the rest of the Paradiski area, linked by a funicular, trails and pistes to Peisey-Vallandry; and to La Plagne by the huge Vanoise Express, that takes it’s passengers across the valley. Bourg-saint-Maurice sits below Arc 1600, and is the last large town along the Tarentaise valley in the heart of the French Alps. Linked to Arc 1600 by a funicular railway, Bourg-saint-Maurice offers an abundance of restaurants and night-life in both the summer and the winter. The surrounding mountains are good for skiing during the winter season, or hiking, mountain biking and road biking in the summer. Bourg-saint-Maurice gives easy access to the Paradiski area via the funicular. To access the funicular go to the lower funicular station, which is behind the train station in Bourg. Buy a ticket at the ticket office. The SNCF train station in Bourg-saint-Maurice is the last station for the TGV, Eurostar and Thalys from Paris (high speed train). Bourg-saint-Maurice is only a 40 minute drive to Tignes, where summer glacier skiing is available on the Grande Motte. In 1968, the major works began developing les Arcs resort. The resort of Arc 1600 was the first to be built. Arc 1800 was built in 1975, Arc 2000 in 1979 and Arc 1950 in 2003. There was once a cable car from the centre of Bourg Saint Maurice directly to Arc 1600, but in 1989 it was pulled down and replaced by the aerial funicular, which took 3 years to build. Each village offers restaurants, bars and accommodation with access to the mountain. More information can be found on the les Arcs website. Today the Paradiski area consists of: 425 km of pistes (120 blues, 66 reds, 36 blacks, 10 greens) between an altitude of 1200 and 3250 metres. There are 2 glaciers, 2 snowparks, boarder-cross tracks, a halfpipe, a waterslide, 3 luge tracks, 11 competition pistes and 153 km of cross-country pistes. At the summit of les Arcs’ ski area, the Aiguille Rouge (3226m), an unsupported cable car serves skiers in the winter season. It spans 1068 metres, with a vertical ascent of 533m. In the summer there is 180 kilometres of marked trails for bikers, with 2,600 metres of vertical decent. Routes are reachable for every level, thanks to 20 chair lifts, which are adapted to hold bikes. There are 22 runs including 8 Downhill, 5 Enduros, 3 Cross Country and 6 connecting runs. Not to mention golf, hiking, white water rafting, tennis, para-gliding, swimming, adventure courses, horse-riding and rock climbing. Click here for the official les Arcs website. After the New Year weekend in 2014 when 29,000 cars and coaches were reported stranded in the Tarentaise valley because of a snow storm, 1st Lifts writes about driving safely in the Alps. We hope this helps you prepare for harsh winter conditions if you decide to drive yourself to the mountains for your ski holiday. The alternative is, of course, to hire professionals who are used to the conditions and will be ready prepared, like 1st Lifts. To reduce the chances of starting a wheel spin be gentle with the clutch and the accelerator. Use high gears. Pull away in second gear if you can; this will send less torque to the wheels, reducing the chances of digging yourself into a hole. Steer and brake GENTLY. Heavy, sharp braking or over steering can lead to skidding. Once you start skidding the vehicle is out of control. Drive slowly, and use major routes as oppose to the back roads. Major roads are more likely to be cleared, and will have a higher traffic volume that will clear the road from snow. Always clear the body of your vehicle from snow before setting off. Good visibility is necessary and snow on the bonnet can obscure your view. Snow on the roof can fall across the front or rear screens, startling you or other drivers and obscuring your view. It is not a legality in the Alps to carry snow chains in your vehicle in the winter, but in cases of heavy snow the police will not allow vehicles to drive to resorts without them. It is all very well to carry snow chains, but you also need to know how to put them on. 1st Lifts drivers practice putting snow chains on regularly, so it is easy when it comes down to it, in the dark, in a snow storm, in freezing temperatures. Two chains are the minimum advised – check your vehicle handbook for advice on which tyres. Always pull safely off the main road to a flat surface to fit your snow chains. Put them on IN GOOD TIME. There is no point waiting until you are half way up a mountain, in 4 foot of snow, sliding backwards. If the weather starts to get bad, put them on when you get to a snow chain area (indicated by signs in France). Your 1st Lifts driver will be experienced in when to fit the snow chains. Look for snow chain lay-bys, there are many around on the major roads. If you get stuck push your vehicle to the side of the road, to a safe area before getting out to fit your snow chains. It is a good idea to carry a head torch, gloves and a mat to kneel on, whilst fitting your snow chains. Always carry warm clothes and a good pair of boots in case you have to walk. You must remove your chains when you get to a gritted/cleared road surface. Snow socks are not as effective as chains and they are not considered an good alternative to chains in areas where snow chain signs are posted. 1st Lifts vehicles have snow tyres, not just winter tyres. Winter tyres are designed to give you extra grip during the cold months. Snow tyres have tread patterns specifically designed to bite into snow and ice. They are made from softer rubber that will retain flexibility in cold weather so the tyre conforms to the surface of the road. All season tyres will go hard and are less pliable in cold temperatures. Snow tyres display a snow flake symbol to show they are of a certain standard. In France winter tyres are not compulsory. Obviously if you are going on a ski holiday you will have warm clothes. That said they should be easily accessible in the dark, during a snow storm. Make sure an extra jumper, snow trousers, boots, hats, gloves, scarves and a jacket are easily available for each passenger. It is compulsory in France to carry a European breakdown kit in the vehicle, and it is also very sensible to have one! Breakdown kits include a hazard warning triangle and adult high visibility vests, which are both compulsory in France. You can purchase European Breakdown Kits from the AA, here. Failing the above – ask 1st Lifts to pick you up from the airport and drive you safely into the Alps so you can sit back, relax and not worry about driving in harsh winter conditions. This post is solely used for advice. 1st Lifts will not responsible for any course of action after reading this information. You are responsible for your own driving. Stay safe! There are plenty of bars and restaurants available to you the Paradiski domain, for lunch, dinner, on the piste with terrace views and vin chaud! The bars and restaurants of Paradiski are listed here for your information with website links, if available. La Vache is a small, beautifully located mountain restaurant. The perfect place for a cold beer on the terrace or a glass of wine with friends! The ambience is relaxed, with live music nights and an interesting and varied delicious menu. You can pop in for coffee or spend all afternoon relaxing with the most amazing view. On piste ski-in, ski-out bar with a terrace in Vallandry, part of the Paradisi. Extensive food menu for lunches, afternoon tapas and evenings. Friendly atmosphere. Looking for a good night out? Plenty of party nights for holiday makers, locals and seasonaires alike. DJ’s, live music, seasonaires nights, live sports, fancy dress and theme nights. Open every day from 9am until 2am in the winter season. The restaurant Le Golf Theme is a buffet menu that changes every evening. Restaurant le Petit Zinc à la carte is an Italian themed restaurant, available for evening meals and Restaurant le Mont Blanc specialises in Savoyard meals like fondues and raclette. Please reserve for the latter two. Piste side mountain chalet restaurant on the south side of Champagny. Typical Savoyard food with a modern twist. A good place to sit and warm up with a vin chaud in front of the fire. Mountainside restaurant at 2100m above Belle Plagne & Champagny, this Alpine ski restaurant has a terrace with great views. Local Savoyard dishes made from regional cheese and meat, Roc des Blanchets is known for good food at a good price. Traditional Savoyard food and dishes are found in Le Choucas Restaurant in Les Arcs 1800. Fondues, tartiflettes, raclettes and other local dishes. Make sure you book, as it can get busy during peak season. Home made local specialities, Au Bon Viex Temps restaurant offers a free shuttle bus service (call to book in advance). Soak up the sun on the terrace or dine inside. In the heart of Charvet in Arc 1800 the Mountain Cafe Restaurant in Arc 1800 is a Tex-Mex restaurant, serving fajitas , fabulous chili con carne, or triple Mountain burger specialties of the house. In summer every Wednesday night are theme nights (giant paella, mussels/fries, chili con carne), where you may end up dancing into the night. Open in the winter and in the summer this little restaurant located in Pre St Esprit is superb. Dishes include seafood, meat, grills and more. Open during the winter and the summer Belliou La Fumée has an outdoor sun terrace, swimming pool and Jacuzzi, so can have a drink, snacks, breakfast, lunch or take a dip in the pool. There is a free shuttle down to Pre Saint Esprit. Remember to book to avoid disappointment. Mountain restaurant located about 500m from the top of the Lac Noir gondola. A flavoursome Savoy cuisine, warm atmosphere in a stunning setting. This family restaurant at the top of the Pierres Blanches chairlift and the bottom of the Dos Rond chairlift has run since 1975. Terrace seating 250 and a solarium with an unbeatable view of the valley and the Mont Blanc. Local cuisine and typical Savoyard french food in a warm, cosy atmosphere. Large terrace and warm cosy interior. Traditional Montagnard restaurant offers tartiflette, raclette and fondues made from recipes passed down from their grandparents. All the hot dishes are made in house. Serves lunch between 12.00 and 14:00, and dinner between 19:00 and 21:00. Heated indoor pool, a sauna, steam room, massage therapy and beauty treatments. Deep Nature Spa is at Les Sources de Marie in Les Arcs 1950. Two treatment rooms, which includes a double. Herbal tea provided. Open from mid-December to the end of April every day from 10:00 a.m. – 8:00 p.m. Call +33 4 79 04 34 34, email alpagesdechantel@deepnature.fr or visit the website for more information. Three star hotel in Arc 1800 offers 3 restaurants and a Deep Nature Spa. Sauna, steam room, relaxation room, indoor relaxation pool and whirlpool alongside algotherm treatments such as massages, body treatments and facials. Conventional treatments and the “Premier Spa” for children from 6 to 15. Advisable to book. Open every day from 10am to 1pm and from 3pm to 8pm, in winter. Go Bowling in Les Arcs 1800! For a bit of night time entertainment or aprés ski; there is a bowling centre in L’Arc 1800 where a bar and snacks are also on hand. Open throughout the winter season December to April. The Igloo Village in Arc 2000 is the biggest in France. Inside the Igloo Village is an ice sculpture gallery, bars, a restaurant and a dance floor. Enjoy a break from skiing at one of the ice bars open from 10.00 to 16.30. Have a coffee on the terrace whilst soaking up the sun or venture into the giant igloo to enjoy the indoor bar where the chairs are carved in ice. The restaurant opens between 19:00 to 20:30 and is reservation only. Begin your evening with a glass of mulled wine followed by a delicious Savoyard meal of fondue. You can even spend the night at the ice hotel, on a bed of ice in a giant igloo. Rooms can sleep 2 or 4 people. Sleep in snug sleeping bags at 2000 metres above sea level! The ice cave gallery contains ice animals, mermaids and other sea creatures carved out of the walls, open from from 10.00 to 16.30. Adults: 5 euros, Children – 12 years: 4 euros, Children – 6 years: free. Pedestrians can get to the Igloo Village by taking a brisk snowshoe walk. Toboganning is great fun for children and adults alike! Paradiski has a 4 toboggan runs. The toboggan run in the Rodéo Park at Arc 2000 is 3km, and you can speed down it all day until the runs close. Mille8 is a new area in Arc 1800 which will open until 7.30pm every day, 8.30pm on Thursdays. There is a toboggan run, an illuminated and themed discovery trail in the forest, a freestyle snow park, a beginners area and a secure children’s play area. Inside the Aquafun Centre will be a pool, bubbling massage beds, whirlpools, cascades, caves, water games area for children, a wellness centre and a fitness centre. Walkers and skiers will both be able to access Mille8 via a new 8-person cable car (Télécabine des Villards) from Arc 1800. Entry to the ski area is included in all ski passes. Yay! There are plenty of bars and restaurants available to you in Les Arcs 2000, Les Arcs 1950, Les Arcs 1950, Les Arcs 1600 and Villa Roger alike. We have listed some on our blog post “Paradiski Restaurants” to help you choose! If you like hiking, you will love snow-shoeing! Hire some snow shoes from many of the ski hire/sports shops around the area. Take a guided tour for a full or half day with a local guide, off the beaten track to discover the forests and animals of the area. This page is written for information only. 1st Lifts cannot be liable to any disappointments or wrong prices. The Igloo Village in Paradiski’s Arc 2000 is the biggest in France. A second Igloo Village is situated in Plagne Soleil where you can simply go for dinner in the restaurant that seats 50, or stay over night too. After a drink around the fire, you will be served a Savoyard fondue accompanied by mountain charcuterie inside the igloo. “Grandmothers” famous red wine, dessert and a nightcap is all included. 17.00 to 22:30. If you stay over night you have the choice of a bed of ice or the hot igloo; a heated panoramic structure with a wood stove and double bed. Either way you will be delighted with the view of the valley and Mont Blanc, and a beautiful morning sun rise. The Bob-Raft is equipped with an auto guide control and automatic brakes and is ideal for families. It can take 4 people. The Bob-Raft goes around 70-80km! In the Speed-Luge you can go up to 90km/h. You will be by yourself, in an almost lying position inside the luge, which is well padded and has autoguide control. Or you can go with a professional pilot, sitting behind them in the luge with up to two other passangers. With a professional you can reach up to 120km/h. Vist la-plagne.com for more information or call +33 (0)4 79 09 12 73. From mid December to mid March there are introductory course to glacier climbing on the Champagny ice tower. The ice tower is 22m high and is made of three sections with inclines adapted to different abilities; from the beginner to pro. Wearing a harness you will use ice axes and crampons (provided) to climb up pure ice in a bid to reach the tower summit. You can drive to the ice tower, it is situated in the valley of Champagny le Haut at 1500m altitude. 1st Lifts will be happy to take you if we are free, just contact us! You must be 10 years old or more do the ice climbing. Courses run on Tuesdays and Thursdays from 17:30. Please check that the tower is open; it may be closed in adverse weather conditions. Rates: €38 per person for 2 hours. For more information visit champagny.com or phone +33 (0)4 79 55 06 55. Speed riding (also known Parapente) is when you ski/snowboard off the mountain with a parachute. You then literally fly around the area checking out the views of Paradiski and beyond. You land back on the snow, using your skis/board- hence the reason you should be a good skier/snowboarder. There are two areas in La Plagne – Colorado Park (1.5km) and Eldorado Park (2.9km). In Mille8 there is a toboggan run with lights and music. Mille8 is a new area in Paradiski open every day this winter at Les Arcs 1800 until 7.30pm, 8.30pm on Thursdays. We all should have done it – started to get fit for our winter holiday way before now. We have 1 month until the first lifts open in the Alps and we are in training! Hobbling around the ski resort after 2 days of skiing, and not enjoying the rest of your week, is NOT COOL! Stay strong and injury free by training your body before you come on your ski holiday. 1st Lifts brings to you some suggestions on the areas of your body you should be working, and some exercises to help you. You’ll be good for the snow in no time! Start gently with one set of 10 to 20 reps of the exercises, then gradually increase to two or three sets as your strength improves. Rest every third day (you can do serious injury without rest). More experienced exercisers can rest one day a week, but will know to take a de-training week. Drink water during exercise. I am not a fitness instructor, please get expert advice. Your quads are probably the most used muscles in both skiing and snowboarding. Your quads include the 4 big muscles in your thigh, oh you know them! These muscles hold you in position as you ski and provide protection for your knees. Good exercises for the quadriceps are squats and lunges. Squats and lunges will also help the secondary muscles around your knees. I don’t have to explain what squats and lunges are do I? Your hamstrings are the muscles in the back of your thigh, which, along with the quads, allow you to bend your leg at the knee. And we all know where glutes are right? Yup, in your arse. People who get hamstring strain often have stronger quads than hamstrings (or they haven’t warmed up properly). Snowboarders often build a lot of strength in their quads and forget the hamstrings. When riding, the hamstrings are used when the hip joint is extended during toe-side turns in both legs. This movement is not a full extension amongst the majority of snowboarders therefore the muscles in the hamstrings under develop. Downhill skiers typically lean forward from the hips, holding their bodies in a flexed position. This requires great strength from your hamstrings and glutes because they help to stabilise your body. The deadlift is a weight training exercise in which a loaded (or unloaded in some cases) barbell is lifted off the ground to the hips, then lowered back to the ground. Ask your gym instructor to help you with this. A really easy one, where ever you live. If you don’t have a step take a run to the park and do them there. If you have a swiss ball or there is one at your gym hamstring rolls are great. This is the one where you lie face up with your arms pressed into the floor by your sides, knees bent, heels on top of the ball. Now lift your hips up off the floor and, keeping your hips high, slowly extend your legs and roll the ball away from your body (don’t lock your knees). Bend your knees and curl the ball back into your body so you are at the start position. In a skier your inner thighs work hard to keep your skis together. Your outer thighs keep your body stable and help you steer. Some great exercises for skiers are side lunges, Swiss-ball squeezes for the inner thigh or sliding side lunges using disks. Lie on the floor on your left side with your body straight and rest your head on your outstretched left arm. Cross your right leg over your left and place your right foot on the floor so that you can lift your lower (left) leg. Raise your left leg by lifting your foot 8 to 12 inches off the floor. Slowly lower your foot back to the floor and repeat before rolling over and changing sides. Lie on the floor on your left side with your body straight and rest your head on your outstretched left arm. Bend your left leg so that your left foot is somewhere close to your right knee. Lift your foot right foot 12 inches off the ground. Slowly lower your foot back to the floor and repeat before rolling over and changing sides. Be careful with this one as it can put strain on your back. Lie on your back with your legs extended in front of you and your arms on the floor at your sides. Make sure your lower back is flat on the floor by pulling your abdominal muscles in. Lift your legs off of the floor to 45 degrees, feet pointing straight toward the ceiling. Open and close your legs in a scissor-like motion. Do half with right leg crossing over the left and then repeat with the left leg crossing over the right. You can make these exercises harder by wearing ankle weights. You can use a cushion for this one, or an exercise ball. Lie on your back with your legs bent, feet flat on the floor and cushion between your knees. Press your knees together and squeeze the cushion really hard for about 5 seconds. Relax then do it again. Because your knees are bent as you ski, your calves help you stay upright so you don’t fall over (your boots help too). We’ve all done calf raises before (haven’t we?). You can stand in front of a chair for stability, with your feet hip width apart. Now just raise your heels so that only the ball of your foot is off the floor. You can do this on the edge of a step if you are confident, with dumb bells or one foot at a time. These strengthen the muscles surrounding the front and sides of the shin bone, helping to reinforce it. Start by sitting with both feet flat on the floor. Your heels will stay on the ground whilst you lift the rest of your foot up as much as possible – you should be pointing your toes at the sky. Hold for a moment, then slowly return your foot to the starting position. This is the one where lie on your back like you are going to do a sit up. With your knees bent your hands will rest softly on your temples, elbows out. Now bring your left elbow up (keeping that hand on your temple, your head and shoulders will rise as well) and your right knee up to meet in the middle, twisting as you go. The one we all love to hate. Lie on your back, bring your legs up and your arms up to meet in the middle above your head. Now slowly lower your legs and your body back on to the floor. Lie on your front, legs straight, tops of your feet flat on the floor. Your hands will rest softly on your temples, elbows out. Now raise your head and chest off the floor, hold and then come down. This is where you have one knee and one hand (same side) on the weight bench. With a dumbbell in the other hand (palm facing your torso), keep your back straight, keep your head up and the weight should hang directly in front of you as your arm hangs. Keep the torso stationary, lift the dumbbell to your side, keep the elbow close to the body, squeeze the back muscles and hold. Slowly lower the weight again to the starting position. If you are the member of a gym you can also do lat pulls. Along with your back, arms help push off with your poles while stabilizing your shoulder joints. Snowboarders use their arms when setting off from the floor and to move in the right direction. Don’t forget your biceps and triceps! Simple exercises for your arms include bi-cep dips (which you can simply do on a chair) and press-ups. Warm Up and Warm Down! You are way more likely to come home with a ski injury if you have not warmed up before skiing and warmed down after skiing. Those people you see actually stretching; the ones you’ve laughed at? That is now you. Stretching and a little jog before and after will help you to keep going the whole week. PLEASE NOTE: None of the information on this page is provided by a doctor or sports expert. The information is here as a guide and 1st Lifts is not liable for any injuries or unfortunate activities that may arise from this information. Please ask your gym instructor or an expert to help you. You ski and snowboard in the Alps at your own risk.